One Book for Teens is a companion program to One Book, One San Diego, that is just for tweens and teens. In February, the community is asked to nominate titles the entire community should read together - for adults, teens and kids. The Children's and Young Adult Selection Committee reviews these nominations and ultimately selects a title they believe fits our selection criteria best. In the fall, KPBS and our community partners host events inspired by the book for teens, tweens and their families. 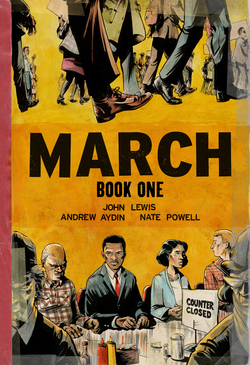 "March: Book One," a graphic memoir by Congressman John Lewis, Andrew Aydin and Nate Powell. The first in a series of three, March: Book One, is a vivid first-hand account of the early life of the Civil Rights icon, John Lewis, including meeting Martin Luther King, Jr. and the birth of the Nashville Student Movement. John Lewis and other student activists drew inspiration from the 1958 comic book “Martin Luther King and the Montgomery Story.” Now, his own comics bring those days to life for a new audience, testifying to a movement whose echoes will be heard for generations. Zeina Abirached, author of the award-winning graphic novel “A Game for Swallows,” returns with a powerful collection of wartime memories. 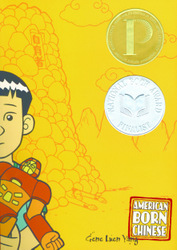 Jin Wang starts at a new school where he's the only Chinese-American student. When a boy from Taiwan joins his class, Jin doesn't want to be associated with an FOB like him. Jin just wants to be an all-American boy, because he's in love with an all-American girl. Danny is an all-American boy: great at basketball, popular with the girls. But his obnoxious Chinese cousin Chin-Kee's annual visit is such a disaster that it ruins Danny's reputation at school. The Monkey King has lived for thousands of years and mastered the arts of kung fu and the heavenly disciplines. He's ready to join the ranks of the immortal gods in heaven. But there's no place in heaven for a monkey. Each of these characters cannot help himself alone, but how can they possibly help each other? They're going to have to find a way―if they want fix the disasters their lives have become.